Combining modern technology with years of experience, Elkhart’s industrial systems are designed for use in many different types of industrial settings, including: refineries, chemical plants, loading docks, tanker berthings, railroad yards, offshore platforms, etc. 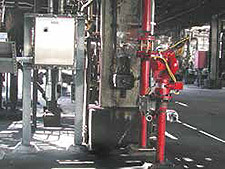 A complete Elkhart Brass industrial fire suppression system is composed of hardware (water cannon or monitor, nozzle, valve, etc. 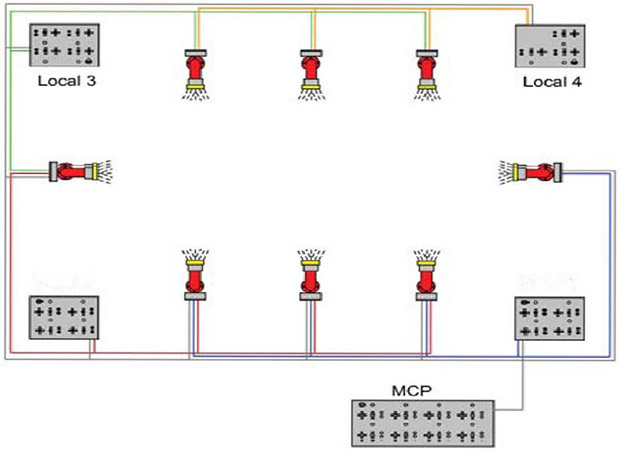 ), electrical capabilities (control system, wiring, etc. ), programming, and integration of the hardware and software within the facility. Elkhart customizes all aspects of our approach to deliver an industrial system suited to your needs. Having Elkhart handle all aspects of your industrial system means your project goes in on schedule, on budget and performs as expected. Electric Remote Controlled Monitor systems are pre-engineered systems specifically designed for hazardous location Class I, Division or Zone 2 environments. Each ERCM includes: monitor / water cannon (85 brass), master stream nozzle (brass*), monitor junction box (stainless steel), monitor motor control panel (stainless steel), and an operator control panel (stainless steel). Hydraulic Remote Controlled Monitor systems are pre-engineered systems specifically designed for hazardous location Class I, Division 1 environments. 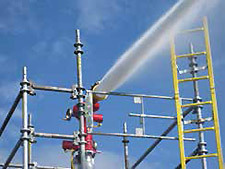 Each HRCM includes: monitor / water cannon (85 brass or SS), master stream nozzle (brass), valve & pump box (NEMA 7/4 cast aluminum) with spool assembly (welded steel riser pipe), and operator control panel (NEMA 7/4 or NEMA 4X). 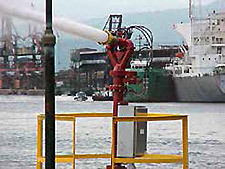 Custom systems are designed and engineered for your specific hazardous location application. This could include anything from gas mitigation to mining operations to marine & saltwater applications. Custom systems allow the user to specify how many monitors per system, the environmental rating, material, actuation type, communication type, etc. For years of dependable performance and protection in extreme environments. 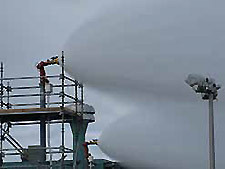 tanker berthings, railroad yards, offshore platforms, etc. Utilizing over 20 years of experience in remote control systems, Elkhart Brass customizes all aspects of our approach to deliver a system suited to your needs. Having Elkhart Brass handle all aspects of your industrial system means your project goes in on schedule, on budget and performs as expected. Prompt response can mean the difference between a minor inconvenience and a six-month plant shut-down. Instantaneous control needs to be in reach, but well out of harm's way. The Elkhart Brass advanced electronic controls provide prompt and dependable control of potential crisis situations. That's just one reason why the biggest names in industry protect their physical investments with Elkhart's electronic remote controlled monitor systemss(ERCMs). They also know that Elkhart has the experience and capabilities to do the entire job right - right from the start and all the way through final installation and service. Leveraging Elkhart Brass’ know-how in the industrial system arena gives you a hassle-free experience. — to build systems tailored to your specific requirements. turn on the water supply, direct monitors vertically or horizontally, and change the stream pattern of the nozzle — all from a safe distance. Electronic monitors offer more control options while maintaining a similar price point to hydraulic monitors. Additionally, with electronic monitors, the controls themselves are fully integrated into the system. Network communications are adaptable to changing needs while being cost-effective.